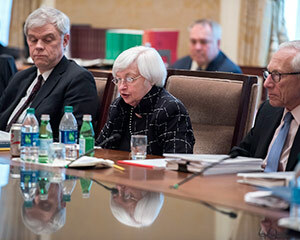 The fourth FOMC meeting of 2016 kicked off yesterday and will conclude this afternoon when the Fed announces an interest rate decision and economic outlook. Just a few weeks ago, the June FOMC meeting was expected to be one of the most anticipated Fed meetings of the year. Since then, the odds of an interest rate hike have fallen significantly. Investors will mainly dissect the U.S. Federal Reserve's tone when they make an interest rate decision this afternoon. In other words, every comment will be analyzed for hints of when to expect an interest rate hike in 2016. Earlier this year, the June Fed meeting was considered the likely time for officials to raise its benchmark interest rate. According to CME Group's FedWatch, the chances of a June rate hike were 34% in mid-May. In March, the odds were at an even 50%. That was back when economic reports suggested a rate lift was appropriate. The labor market was robust, while inflation and wage growth were showing signs of inching upwards. Roughly 215,000 jobs were added in March. Hourly earnings also increased 0.3%. But the odds of a rate hike this month were completely shattered on June 3 when the May jobs report came out. According to the U.S. Labor Department, only 38,000 jobs were added in May. That was far below the projected 158,000 and marked the worst month for the jobs market since September 2010. Another factor lowering the chances of any interest rate boost is the Brexit referendum. On June 23, citizens of the United Kingdom will vote to decide whether or not the country leaves the European Union. Since a Brexit would have a big economic effect on the country's trade and relationship with the United States, the Fed is hesitant to raise rates right before the big decision. And the Federal Reserve's hesitance is obvious. When Yellen and other officials began the FOMC meeting yesterday, the odds of a rate hike stood at a mere 1.9%. In other words, a June rate increase is clearly off the table. When the Fed hiked rates for the first time in nearly 10 years last December, it projected four rate hikes in 2016. But market volatility and other global factors made officials pause for seven months. Now, several economists say the Fed has lost its window to lift rates again this year. July FOMC Meeting: Odds of a July interest rate hike have plunged from 56% in May to 17.9%. The biggest argument for why the Fed won't raise rates next month is because the FOMC won't have a post-meeting news conference. Yellen isn't bold enough to move rates without being able to explain her actions to the public. September FOMC Meeting: There's currently a 29.4% chance of a rate hike in September. If a Brexit vote in the UK doesn't trigger another global market meltdown, odds of a rate increase could tick up. The Fed is itching to boost rates and September may be its best chance this year to make a move. November FOMC Meeting: The probability that the Fed raises rates one week before the most contentious presidential election in recent memory is currently 39%. But the Fed has historically avoided policy shifts during election season to prevent its actions from influencing voters. December FOMC Meeting: With a 57% probability, a rate hike is a big possibility at the December meeting. After all, the Fed implemented it first interest rate hike in nearly a decade last December. Still, the FedWatch tool shows just a 31.6% chance of at least one rate boost by the December meeting. This all means investors can certainly expect lower interest rates over the next few months. Follow us on Twitter @moneymorning and like us on Facebook for the biggest updates on the Fed's interest rate moves.